Vietnamese nationalism (Vietnamese: Chủ nghĩa dân tộc Việt Nam) is the nationalism that asserts that the Vietnamese are a nation and promotes the cultural unity of the Vietnamese. It encompasses a broad range of ideas and sentiments harbored by the Vietnamese people for many centuries in the history to preserve and defend the national identity of the Vietnamese nation. Unlike any type of nationalism in the world, Vietnamese nationalism appears in every aspect of the society, from cultural, folklore and even military, which led Vietnam into becoming one of the world's most nationalistic countries. Most of Vietnamese nationalism focuses on the military history of the country; however there are also other aspects of the nationalism in Vietnam. However, most of Vietnamese nationalist concepts aim mainly on China, which has many times fueled the anti-Chinese sentiment in Vietnam, although there are other anti-Cambodian and anti-French as well, with nothing much significant. Vietnamese nationalism appeared since the independence of Vietnam around 2,800 years ago, when Vietnam was made up of the independent kingdoms under Văn Lang and Âu Lạc. In there, Vietnam was one of the oldest-formed nations in Southeast Asia, Asia and the world. However, following with the later Chinese millennium in Vietnam, several attempts against Chinese occupation resulted with many wars that happened throughout thousand years of Chinese rule, after which Vietnam finally regained independence in the 10th century following the battle of Bạch Đằng. Through then, Vietnam remained very militaristic and nationalistic due to the history of Vietnam often had brutal past with China and later, with its neighbors like Champa, Khmer Empire, Lan Xang, and later with Siam, which led to many wars. One of these wars had a serious effect, with the destruction of Champa Kingdom. Lý Thường Kiệt's famous declaration of Vietnam's independence, Nam quốc sơn hà (Mountains and Rivers of the Southern Country), is a patriotic and nationalistic poem that still lives on in Vietnamese society generations later and now. During the Vietnamese "March to the South" or Nam tiến in which they, over the span of 700 years starting from the 11th century during the Lý dynasty gradually invaded and colonized the entire state of Champa and parts of the Khmer Empire. During the period of conquests, the Vietnamese attempted to assimilate all of the ethnic minorities in the territories that they had captured by forcing them to adopt Vietnamese customs. The Vietnamese saw themselves as belonging to a superior culture, having been Sinicized, unlike the Indianized states of Champa and the Khmer Empire. As such, they saw themselves as carrying out a civilizing mission against the minorities who were not sinicized and were seen as barbarians. In spite of considering themselves as superior due to being sinicized, members of the Vietnamese royalty looked down upon those that were non-Vietnamese as inferior due to Chinese influence. The first real concept of Vietnamese nationalism dated from the late 18th century, when the Tây Sơn reunited Vietnam into a single state after being separated into Trịnh lords and Nguyễn lords's North and South. Throughout of time, there were numerous massacres against non-Vietnamese ethnics such as the Cham people and Hoa people. In the North during the time of the Trịnh Lords, the Trịnh mandated that the Chinese entering the country had to strictly follow Vietnamese customs and refrain from contacts with the local Vietnamese populace in the cities. On the later time, after the Nguyễn dynasty ruling Vietnam, the dynasty had been using the Vietnamization concepts to begin its massive Vietnamization of non-Vietnamese people. During the nam tiến period of the Nguyễn Dynasty, the Gia Long Emperor stated that "Hán di hữu hạn" 漢夷有限 ("the Vietnamese and the barbarians must have clear borders") when differentiating between Khmer and the Vietnamese. Emperor Minh Mạng, the son of Gia Long stated with regards to the Vietnamese forcing the ethnic minorities to follow Sino-Vietnamese customs that "We must hope that their barbarian habits will be subconsciously dissipated, and that they will daily become more infected by Han [Sino-Vietnamese] customs." As for the French invasion, many resistances came around but failed. However, following from time, Vietnamese nationalism also changed and through it, it also focused on only one goal - independence of Vietnam, however only after Ho Chi Minh appeared, the Vietnamese nationalism was seriously fueled with it. Later, Vietnamese nationalism also divided after 1945, when two different parties, the Communists in the North and the pro-Western in the South, had affected on Vietnam. Many wars later arrived, but the Northern Communists proved to be more successful on using its nationalism than the South. Their victory on the Battle of Dien Bien Phu had brought Vietnam into serious nationalist conflicts which had led to Vietnam War. Again, after 1975, the Communists proved to be the masters of using Vietnamese nationalism by reunifying it, in power. Still, a series of wars with China, Khmer Rouge and Thailand later affected on Vietnamese growth. The Vietnamization is an attempt to enforce about the Vietnamese pride in every aspects of nation. There has been a growing movement among Vietnamese by boycotting Chinese products, and rather using the Vietnamese-made products, which is called "made in Vietnam" to counter with "made in China". Press medias also play a significant role on promoting the products from Vietnam and limiting Chinese-made products. Despite of being part of Sinosphere cultural influence and sharing many cultural aspects such as Confucianism, and having Chữ Nôm as its former writing script, Vietnam mostly refuses to accept the factor of Chinese influence. Adding with the later conquests of Indianized Kingdom of Champa and Southern Vietnam which was once part of Cambodia, Vietnam believes it is a major cross-road of two civilizations rather than one. Vietnamese textbooks also refer the influence of China but refuses to recognize Chinese elements in Vietnamese nation. For much of its history being razed by wars, Vietnamese developed its nationalism based on its successful history of warfare. Many Vietnamese generals are revered and are a source of pride and nationalism in Vietnamese society, such as Trần Hưng Đạo, the famous general who stood up to the mighty Mongol Empire by successfully repelling the 3 Mongol invasions of Vietnam in 1258, 1285, 1287–88 and Nguyễn Huệ, a revered Emperor and general who defeated the Qing Dynasty of China in the Battle of Ngọc Hồi-Đống Đa, which was a large battle that is considered to be one of the greatest military victories in Vietnamese history. Both Trần Hưng Đạo and Nguyễn Huệ have several streets named after them and statues erected to honor them in Vietnam named, and both are listed as being among the greatest generals in history. Vietnam also heavily honors its long lists of generals in ancient Vietnamese history that fought against Chinese imperialism, such as the Trưng Sisters and Lady Triệu, who were female generals that led major independent movements against Chinese occupation. Ngô Quyền is well honored for being the first to successfully defeat the Southern Han of China at the Battle of Bạch Đằng (938) and establishing Vietnamese independence, Lê Hoàn for defeating the Song dynasty at the same river in 981, and Lê Lợi who liberated Vietnam by defeating the Ming dynasty and founding the Lê dynasty. Vietnamese national pride is heavily promoted in Vietnamese textbooks, especially of its development and its heroism. Many Vietnamese stories are still heavily mentioned in the youth education system and among the older generations which have been regarded as a major factor that keeps Vietnamese nationalism alive. Vietnamese take pride on football heavily and in Vietnam, football is a God sport for the Vietnamese population in majority. When the national team won big matches, the streets are often overwhelmed by large Vietnamese crowds, demonstrating nationalist chants, singing Vietnamese nationalist songs. It has been proven like in 2007 AFC Asian Cup, where Vietnam qualified to the quarter-finals and the only host in this tournament to do so, or in 2008 AFF Championship which Vietnam won, and recently 2018 AFC U-23 Championship which its Olympic team won silver medal after losing the final. It has also stemmed the old, long bloody rivalry exists between Vietnam and China, their historical adversary. Anti-Vietnamese comments have also been seriously noticed, and attacked by Vietnamese supporters. Some fans, notably Uzbek and Thai fans who had disdains of Vietnam, had to block its Facebook until the Vietnamese angers slowed down. According to the Bleacher Report after the 2018 AFC U-23 Championship, they were totally astonished and shocked with the massive celebration of Vietnamese people. One of Greater Vietnam concept which claiming Laos and Cambodia are not sovereign but Vietnamese territory. There are varieties of Greater Vietnam irredentism. 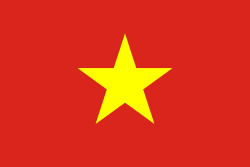 The ideology of Greater Vietnam is a concept among a few radical Vietnamese nationalist parties that claim the territory of Southern China (Yunnan, Guangxi, Guangdong and Hainan), as well as Laos, Cambodia and Thailand's Isan to Myanmar's Shan State as part of greater Vietnamese sovereignty. The idea is just a newly developed ideology following the beginning of 20th century, but largely ignored due to overwhelming focus on defense against foreign invasion. In Vietnamese culture, defending homeland is a sacred cause, while invasions and expansions is heavily vilified, regarded as unethical and immoral. This concept, however, is exploited by anti-Vietnamese groups in Thailand, Cambodia, Laos and China as a conspiracy theory, judged by using historical Vietnamese invasions spanned from 10th to 20th century against its neighbors and their meddling on its internal affairs. ^ "March to the South (Nam Tiến)". Khmers Kampuchea-Krom Federation. Retrieved 26 June 2015. ^ Barbara Watson Andaya (2006). The Flaming Womb: Repositioning Women in Early Modern Southeast Asia. University of Hawaii Press. pp. 23–. ISBN 978-0-8248-2955-1. This page was last edited on 3 February 2019, at 17:48 (UTC).